This smoothie has many beneficial ingredients in it that will do wonders for your body, both inside and out. 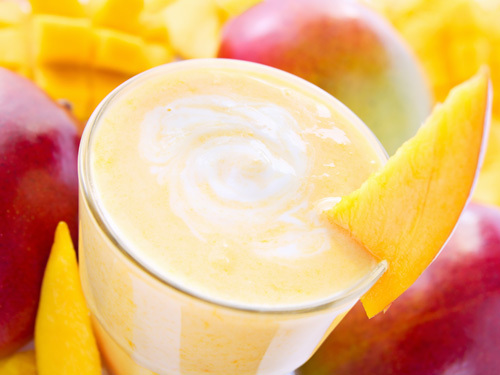 It also has a sweet and tropical flavor to it (thanks to the mango) that makes drinking it enjoyable as well as beneficial. This smoothie works to improve the health of your skin as well as to prevent acne breakouts and is suitable for any and all skin types. Don’t let the fish oil ingredient turn you away, the other ingredients mask any flavor of it and fish oil provides your body with A LOT of benefits. Fish oil can improve the look and health of your skin and aids in reducing redness or blotchy patches on your skin. The benefits don’t stop there either. Fish oil can strengthen hair and leave it looking healthier and shinier and also aids in reducing dandruff and dry scalps. (I can speak from experience that fish oil really does do wonders for your hair. I started taking fish oil gummy vitamins a couple of months ago and noticed my hair growing faster and looking much shinier and healthier.) So, if it can provide you with better skin and hair, why not add a splash of it into your smoothie? Soothe, hydrate and nourish skin with this easy to make recipe that will leave your skin feeling and looking soft and smooth! This delicious facial mask will do wonders for your skin with just 3 simple ingredients! The raspberries (which are bursting with Vitamin C) work to fight signs of aging (wrinkles and fine lines) as well as maintaining skins natural glow. 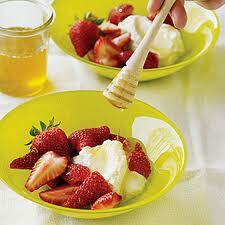 The honey (which is packed with antioxidants) works to moisturize skin while fighting off germs that can lead to acne. Lastly (but not least), the oats do the job of soaking up any impurities that may have been clogging up your pores. 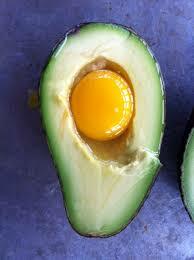 So, if you have 15 to 20 minutes and these 3 ingredients you have time to treat your face to this healing facial mask! This facial mask is easy to make and uses only a couple simple ingredients yet it does a lot of good for your skin! 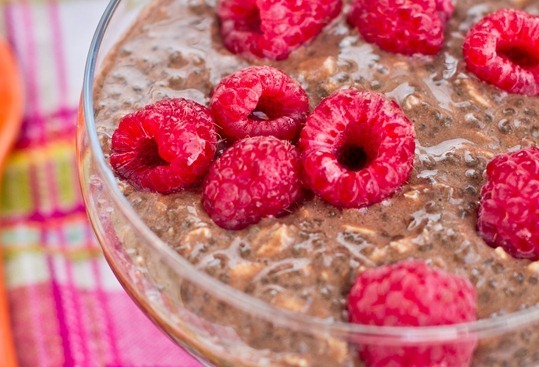 The cream in this recipe will leave your skin feeling moisturized and hydrated. The strawberries help to fight acne as well as to lighten and fade acne scars and blemishes. The honey has anti-septic properties and acts as a mild astringent. It also aids in cleansing the skin of dirt and oil. Cut the green tops off of the strawberries and cut the strawberries in half and place in a small bowl. 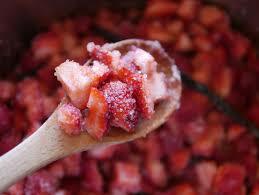 Mash the strawberries with a fork until a pulp forms. Add the remaining ingredients to the mashed strawberries and mix well until all ingredients are blended and a creamy-like consistency forms. This mixture can be a little drippy when you first apply it so you may want to lay a towel down on the counter where you are applying it. You may also want to wear an old shirt when applying it as well. 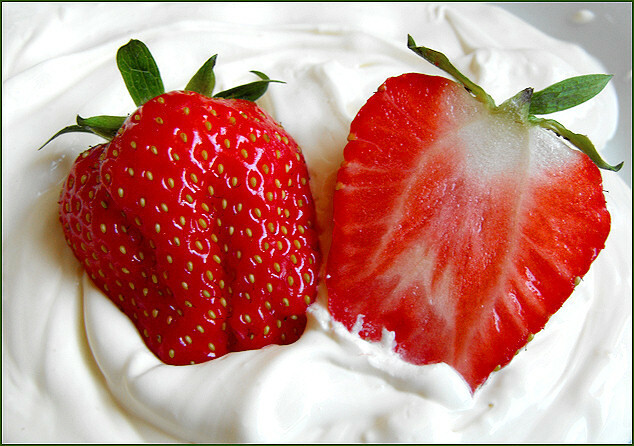 So, a couple of minutes to whip up this recipe and then treat your body and your skin to the benefits of strawberries! In the shower or tub, apply the mixture to your body and gently massage into skin for a few minutes. Then rinse well with warm water. Use caution in the shower or tub when using this scrub (or any). The oils in this scrub can cause the floors to become very slippery and slick which can be dangerous. It’s best to put a rubber bath mat or towel down and use caution as well. OK, since I’ve posted a strawberry foot scrub and a strawberry smoothie recipe earlier today I figured why not post another strawberry recipe? (Besides, I really like strawberries and seem to be on a strawberry kick lately.) So, here’s a recipe for a super easy to make strawberry lip scrub recipe. It’s quick and easy to make and does a great job at exfoliating your lips, ridding them of dryness and leaving them looking healthy and moisturized. Cut the green top off of the strawberry and cut the strawberry in half and place in a small bowl. Mash the strawberry using a fork until it is a pulp-like consistency. Rinse mixture off with a washcloth and some warm water. Follow up with a moisturizing lip balm/chapstick. 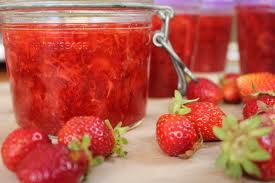 If you have extra mixture leftover, you can store it in a airtight jar but only for a day or two because the strawberry will spoil…this is a mixture better used immediately and made in small batches.